It’s June, and it’s time for the Oregon Ducks to make another push toward the College Football Playoff. Last season, fans saw the Ducks finish the regular season with an 11-1 record, witnessed Marcus Mariota win the first Heisman trophy in school history, and watched Oregon dominate Florida State in the Rose Bowl before eventually losing in the national title game to Ohio State — 2014 was arguably the most successful season in Oregon history. While Mariota is busy learning his new offensive system in the NFL, the Ducks are once again favored to win the Pac-12 North this year. Oregon has greater aspirations however, and will be aiming to play in another New Year’s Six bowl game (formerly known as BCS bowl games) for the sixth time in seven seasons. The pursuit of another playoff berth will officially begin on September 5, when the Ducks host Eastern Washington in Eugene; but that is just the first step in the 12-step program. Avinash Kunnath, of SB Nation, recently ranked the Oregon schedule from easiest to hardest, and believes the three most difficult matchups of this season will be: third, vs. USC (November 21), second, at Stanford (November 14), and first, at Michigan State (September 12). So let’s break down that list. 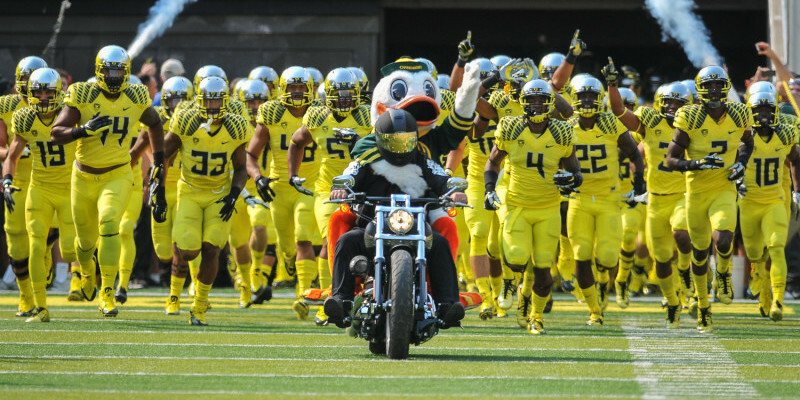 The Ducks will host USC in Autzen Stadium for the first time since 2011, when the Ducks lost a heartbreaker, 38-35. In fact, the matchup against USC will be the first meeting between the two since 2012, when Oregon beat the Trojans, 61-52, in Los Angeles behind Kenjon Barner‘s record-setting performance. Much has been made about USC’s powerhouse recruiting class this year, which ranked third nationally according to ESPN; however, it is made up of unproven freshman who have never played a down at the college level. 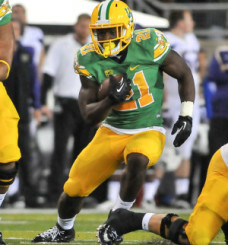 Royce Freeman will be a huge factor in the success of Oregon this year. Also, among others, USC lost stud defensive lineman Leonard Williams (sixth overall pick) to the NFL draft. That loss will be huge for USC, and they will feel it when they come to Eugene. With Williams absent in the middle, the Ducks should be able to effectively run the ball against the Trojans with Royce Freeman and the stockpile of talented running backs on the Ducks’ roster. With USC still rebuilding and dealing with lingering depth issues, I don’t think the Trojans will have enough skilled and experienced bodies to keep up with the Ducks just yet. This is likely to be a matchup of two top-10 teams, and could possibly be a ‘playoff elimination game’ if they both come in undefeated. A lot could be decided come late November. Kunnath believes that the November 14 game at Stanford will be the second-toughest game on the Ducks schedule; I disagree. Sure Oregon used to have trouble with Stanford, losing in 2012 and 2013, but those troubles were erased by the 45-16 beat-down the Ducks put on them last year. Stanford had its time as one of the upper echelon teams of the Pac-12, but I believe that time is over. They are still a good football team, but all five of their losses came against ranked opponents last season; with their only win over a ranked team coming against UCLA at the end of the season. Stanford can surely compete with the best teams in the conference, but I’m hesitant to say they can at a consistent enough rate to be considered elite. Finally, the toughest game on the schedule will be at Michigan State on September 12, just the second game of the season for the Ducks. Traveling to East Lansing and getting a win will be no easy task, and the trip will be the furthest east Oregon has traveled since the 2013 game at Virginia. The Spartans return several starters for this season, including senior quarterback Connor Cook, and they will likely be contenders for the B1G title and possibly a spot in the College Football Playoff. With both teams coming off impressive seasons last year, the matchup will again be between two top-10 teams. 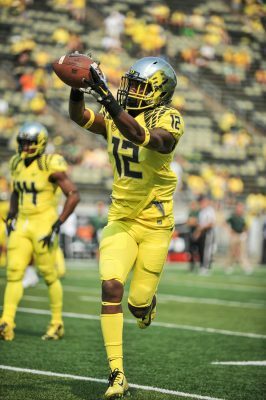 Chris Seisay, and the inexperienced Duck defense, will need to play well in order to get a win. Last year, Michigan State outplayed the Ducks for the first half of the game in Autzen Stadium until Marcus Mariota ignited the Oregon offense for 28 straight points. Oregon won, 46-27, but the game was much closer than the final score would indicate. This time around it will be in the Spartans’ backyard, and MSU has only lost one home game the past two years; with the loss coming last year to eventual national champion Ohio State. In fact, both losses for the Spartans last season came to the teams playing in the national title game, a statistic that is sure to motivate Michigan State as they head into 2015. But MSU did lose both their leading rusher and receiver, in Jeremy Langford and Tony Lippett respectively. With both teams losing key players while also returning an abundance of talent, the matchup will be one of the better games of the early college football season — and I expect the game to be a tightly contested matchup once again. The Ducks will travel to Tempe for the first time since 2012, which is also the last meeting between the two teams. Arizona State went 10-3 last season, and climbed as high as the No. 7 ranking before finishing the year at No. 12 in the AP Poll. Also, The Sun Devils return a combined 16 starters on offense and defense for this season, but don’t return their starting quarterback Taylor Kelly. Even with the loss of Kelly, ASU will likely challenge USC for the Pac-12 South title with their talented young team. I prefer my facilities to be surrounded by green (and yellow). Another factor is that Arizona State wants to be Oregon. 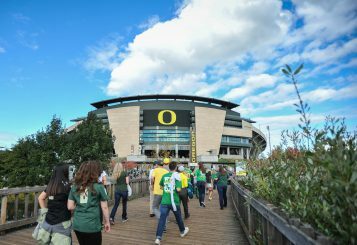 They want the Ducks’ success, they want all the uniform combinations and great facilities, they want the high-powered offense, and they want to be elite; and their new stadium renovations and increased focus on athletic excellence is proof of that. When you want to beat a team that badly, the way that ASU wants to beat Oregon, you go all out in order to do so. And lastly, the game is on a Thursday night, and crazy things can happen on Thursday nights. I expect the Sun Devils to leave it all on the field when Oregon comes to town, but I don’t believe they are ready to dethrone the Ducks just yet. The schedule is favorable for the Ducks, as they have seven home games in 2015, and they should be in position to contend for another playoff berth this year. But even if Oregon is a 10-win team this season, they have higher goals and will need to overcome the few tough games on their schedule if they again want another chance to compete for a national title.